Gleeson utilised bricks as imagery very early, e.g. 'We inhabit the corrosive littoral of habit' 1940, 'Structural emblems of a friend' 1941 and 'The oracle' 1948. 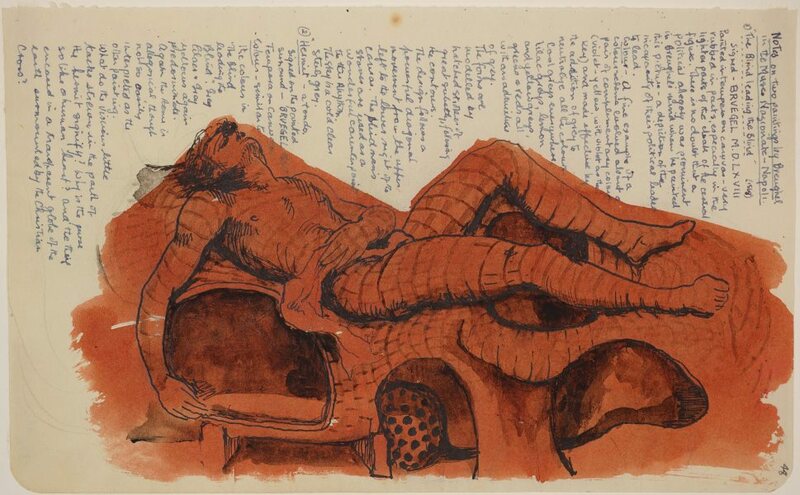 This drawing is for the reclining male figure in 'Sleep' painted in London. 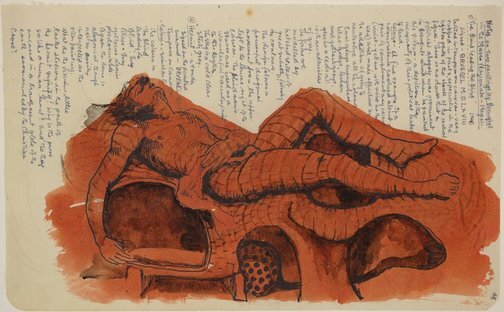 His desire to reveal what lies beneath the surface, a defining theme in Gleeson's work, was illustrated for him by exposed brickwork in bombed buildings in London after the war. Hendrik Kolenberg and Anne Ryan, 'James Gleeson: drawings for paintings', Art Gallery of New South Wales, 2003, pg. 47. Hendrik Kolenberg, James Gleeson: drawings for paintings , 'Introduction', pg. 11-16, Sydney, 2003, 13.